Oh yeah, the Mosbach Nights! What a nice venue! The stage located near a part of an old castle in the middle of a small amphitheatre, a warm summer night: a perfect place for a Hooters show. After the support -"The Urge" from England playing sort of britisch-southern-rock (if such a thing exists)- warmed up the crowd, the Hooters started their show. Like in Karlsruhe they started with "I'm alive" and "Time stand still" from the new album followed by the up-tempo version of "Time after Time". Compared to the Karlsruhe show the setlist has been slightly modified: "Johnny B" has been moved to the second half of the show, directly after "25 hours a day" and I think "Fighting on the same side" has not been played in Karlsruhe. Finally the technicals problems were sorted out and the show continued with "Until you dare" and "Where the wind may blow". The Hooters played a lot songs from the new album before they focused on the hits (25 hours, Johhny B, All you zombies, Karla with a K Satellite and finally "And we danced" in one row) at the end of the show. 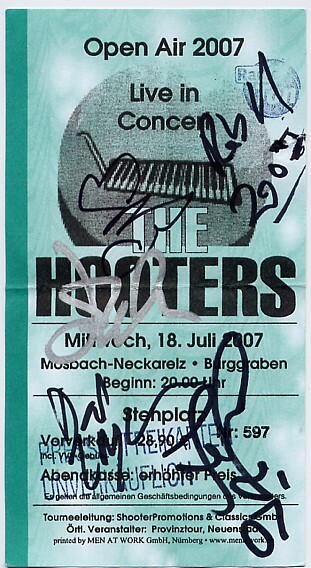 The encores were the great "Catch of the Day", which the Hooters dedicated to one member of the crew, a fantastic acoustic version of "One of use" with one verse in German and finally "Free Again" which truly is a great live song. It's always good to see several shows of one tour since the band modifies bits and pieces of the songs from show to show. My favorites this evening were "Graveyard Waltz/ 500 miles" (as always), "Satellite", "Catch of the day", "one of us" and "Free Again". Unfortunately "Morning Buzz" was missing as well as "Ordinary Lives" which has been foreeen -according to the setlist- as a possible additional encore.